Cap snatching is a transcription initiation process during which a nucleotide sequence between 10 and 20 nt in size is cleaved from the 5' end of host mRNAs by an endonuclease activity encompassed within the viral RdRp . For Influenza this process occurs in the nucleus whereas for most other segmented (-)RNA viruses this happens in the cytoplasm. 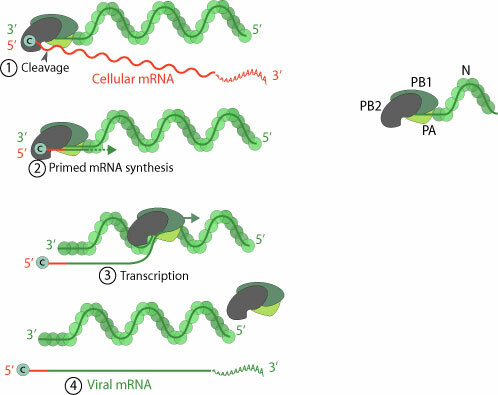 The capped leader obtained is subsequently used to prime transcription on the viral genome, which ultimately leads to the synthesis of capped, translatable viral mRNAs. The dsRNA L-A virus mediates cap snatching although it does not take the entire cap. m(7)Gp from the cap donor is transferred to the 5' end of the viral transcript, thus preserving the 5' α-and β-phosphates of the transcript in the triphosphate linkage of the final product .